Who's Behind the "We Buy Houses" Signs? Though few of my research inquiries for posts for MilitaryByOwner will ever quite reach the heights of response that the dreaded-commode-in-the-listing-photos post did, the response I received from real estate professionals, home sellers, home buying companies, and even a sign-making company for the so dubbed “bandit signs” came a pretty close second. You’ve seen these signs. They promise to buy your home for cash. They don’t care if your home is ugly; in fact, some prefer the uglier, the better. They’ll close a deal quickly. It seems like a great deal, right? Anytime we present information about a topic that’s potentially financially controversial, we aim to provide you with the most objective analysis of the information possible, so that you can make the best decision for your military family. The last thing we want to hear is that you’ve either missed a great financial opportunity for your family, or even worse, that someone has taken advantage of your financial situation and need to sell in order to complete your PCS. With this in mind, read on, and proceed cautiously. Remember, though, if anything sounds too good to be true, it probably is. Grandma was always right. Are these "We Buy Ugly Houses" companies legit? Before proceeding, it’s important for you to know that some of these road signs are actually from legitimate home buyers. Many responses I received shared that these signs only came from “scammers,” but one of the more well known companies, Home Vestors, which is known for their “We Buy Ugly Houses” campaigns, is actually a popular franchise for Veterans, as per BusinessWire and the Military Times. Over 30 of the company’s 606 franchisees are owned by Veterans. The actual posting of the signs themselves rests in more tenuous legal waters, for which we are grateful to Carter Steph, General Counsel for 1-800-2 Sell Homes, for explaining. Steph explained that the signs are posted on either private or public property. If these “bandit signs” are on private property, then Steph explained that they are only liable to zoning restrictions that may prohibit commercial signs. However, if they are posted on public property, then in most jurisdictions the signs violate nuisance ordinances. While some cities lack enforcement for the removal of these signs, other cities, such as Houston, fine sign posters at $500 per day, per sign. Ouch! Steph shared that their company has chosen to not post such signs in their effort to operate as good corporate citizens, as they believe the signs diminish both the beauty of their city as well as the reputation of the real estate investment industry. So what if you do need a quick sale? Should you call their number? The lure of a quick sale is tempting, particularly if your home has sat on the market for a long time. 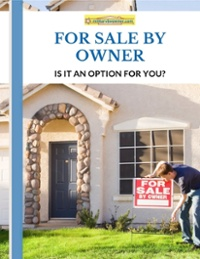 The lure can be even greater if your home sale stands between you and ending an unpleasant situation, such as finalizing a divorce or simply putting a stop to the financial bleed that is your mortgage. Seemingly desperate situations can lead to poor decision making, though, so if you find yourself in a situation where you feel an urgent need to sell, then make sure you have the information below in hand before you call up the first home buying number you see. These signs are designed to attract an “uneducated, unsophisticated, desperate seller to agree to sell at a price that is a fraction of the wholesale price,” shares Bruce Ailion of The Ailion Team in Atlanta. Ailion explained that the buyers are typically pseudo-investors who completed a "get rich" style course based on the same fundamental principles as the “we buy gold” campaigns. That is, “pay less than something is really worth to a desperate person who thinks there is no other alternative.” There is always an alternative, but sometimes you just have to look a little harder for it. Check out our post on 7 Steps to a Last-Minute PCS if you’re looking for a quick sale as a result of a military relocation. Zach Scardino disagrees with Ailion. He owns a sign making company called Scardino Printing and has produced thousands of these signs. Scardino shared that the individuals who purchase these signs from him are not scammers; they are seeking people who need to divest of homes quickly, but not so that they can take advantage of people in desperate times. Rather, they’re helping people who feel stuck with homes that come with large financial burdens, such as a home they inherited or a home with a large tax burden. They also help people who need to move quickly, such as military families. Scardino shared that the buyers often don’t use their own cash to purchase a home, but rather they have bank loans and real estate agents lined up when they make an offer. They generally close the loan quickly and then sell the property again through their local contacts without ever having to make a payment on the initial loan. If you choose to call someone from one of these signs, though, Ailion shares, your best bet is to first contact a real estate professional and explain your situation. He said to “let them know you need the most you can get in a short period.” If you select a good agent, then he or she “...can accurately predict how much you can expect with 14-30 days exposure to the market.” Only armed with this information about your property, Ailion said, should you then consider contacting someone who will make an immediate offer. 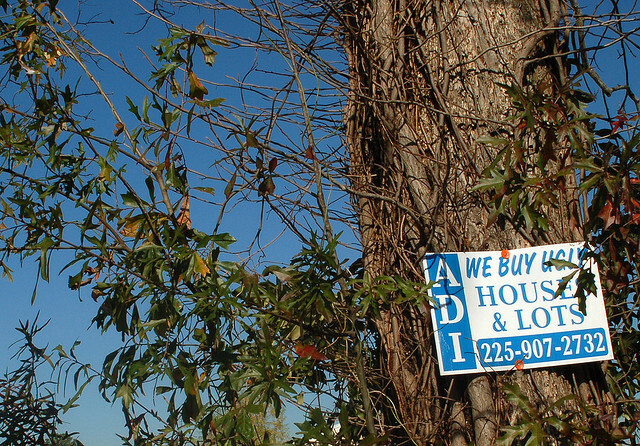 Have you contacted someone from a roadside sign that offered to buy your house quickly? How did that situation turn out for you? Would you recommend it to fellow military families? Note: this post does not constitute legal advice, but is intended for informational purposes only. If you need more counsel, please contact your attorney or military installation's legal office.